We've already taken a brief look at Google's new PayPal-like payment API which was introduced during a session at I/O today. 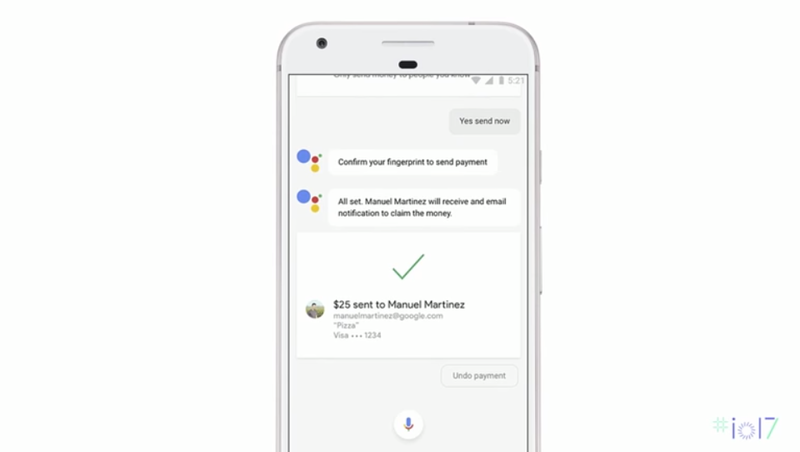 Potentially the coolest application for this is going to be the ability to send payments to friends and others with Google Assistant. During Gerardo Capiel and Varouj Chitilian's session on Google's commerce technologies, they introduced the new API and then proceeded to show us "something really cool that no one's seen before." If you skip 14 minutes into the video, you'll see them set up a feature demo under the pretense that Gerardo needs to pay Varouj for dinner. Instead of using Gmail's "send money" function through the Gmail app, they decide to show us that Google Assistant is now capable of doing the hard work for us. Gerardo asks the Assistant to "send Gerardo $10 for dinner," and sure enough it uses the new payment API to go ahead and send the payment. The p2p payment uses the debit card linked to your Google account, and they also mentioned that they'll soon be adding other p2p payment providers. It's pretty nifty and represents yet another way that Google Assistant is becoming more and more powerful, with lots of great new capabilities being announced at I/O this year.